It was the late 1960s, and the future president of the National Organization for Women faced a dilemma. Toni Van Pelt had just been offered a job at Northwest Orient Airlines. But it paid less than the job she had waiting tables. Rather than ask for a better offer, she walked away. “I didn’t even think to negotiate. I just turned it down,” she told Bloomberg Law Oct. 25. Later, the airline came back with a better offer that she accepted, but that was as a result of a successful union strike, not her own efforts, she recalled. This points to a broader problem: women are less likely to push for a better offer in salary negotiations than men. “I think that women overall are taught from birth that they are not to put themselves forward, that they are to look down, that if they look out for themselves they are being selfish,” Van Pelt said. A recent survey by the jobs website CareerBuilder reflects the experience of Van Pelt and other women. Nearly half of men (47 percent) say they negotiate first offers, while only 42 percent of women say they do, according to the survey. Well over half (56 percent) of workers of both genders just take the first offer they are given, according to the survey, which was conducted by Harris Poll among 3,462 full-time adult private-sector employees May 24 to June 16. 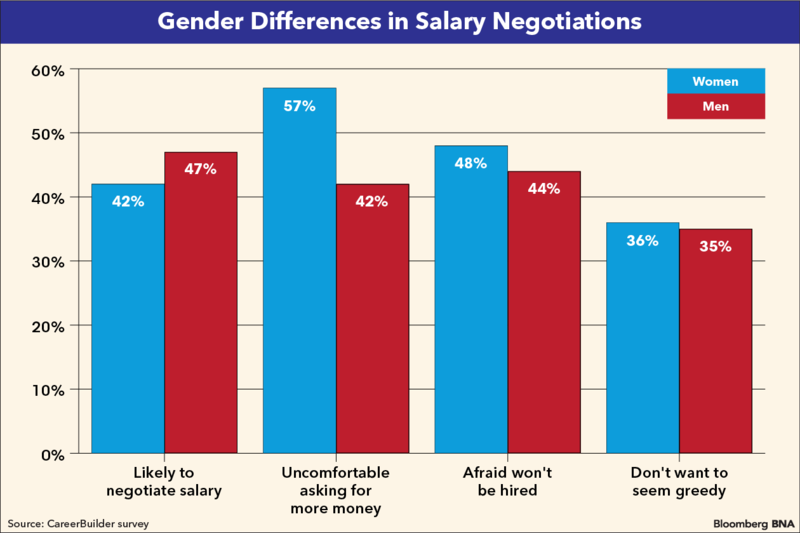 “When we asked women why they were less likely to negotiate, 57 percent of women said they just didn’t feel comfortable asking for more money, compared to 42 percent of men,” Rosemary Haefner, CareerBuilder’s chief human resources officer, told Bloomberg Law in an Oct. 26 email. “Forty-eight percent of women said they were afraid the employer would decide not to hire them (versus 44 percent of men) and 36 percent said they didn’t want to seem greedy (compared to 35 percent of men.)" The 5 percent gender difference in asking for better pay may not seem like much, but “the negotiation gap is one of the inputs to the gender pay gap,” Kevin Miller, senior researcher at the American Association of University Women, told Bloomberg Law Oct. 25. The key is the increasing effect of starting out one’s career being paid less, Miller said. “We know the gender pay gap starts right as women enter their first jobs out of college. The gap gets larger over time as their salary history follows them,” he said. One remedy is the trend of state and local laws barring potential employers from asking about salary history, Miller said. “Not negotiating for your salary could take years of additional work to make a similar income as co-workers who do negotiate,” Haefner said. Van Pelt agreed, pointing out that future raises and even retirement savings are affected when women start out with less compensation. “It affects them their whole lives,” she said. Is It ‘Aggressive’ to Ask for More Pay? It’s considered all right for women “to be strong” in advocating for others, but not for themselves, Van Pelt said. “We need more training for young girls and girls in high school that they can negotiate for the better things in life,” she said. “But there are also gendered concerns that they will come off as pushy and aggressive, and hurt their relationship with their boss,” or even be seen as “unfeminine and difficult to work with,” he said. That’s not to mention that if a woman doesn’t have the job yet, she might not get it all, Van Pelt said. But on the other hand, Miller said, “women can’t negotiate their way out of bias and discrimination,” which is why he said public policy changes are needed.